The Cetaphil DermaControl Moisturizer SPF 30,is, according by the experts, the best option for people prone to acne, and especially recommended in those under acne medical treatment. Its acts as moisturizer, but also it controls the oil and shine besides to provide sunscreen. Is a light, non-comedogenic and non-oily facial lotion that has been designed for daily use in patients with acne. It can be used alone or for daily as an adjunct to anti-acne therapy. It is specially formulated to control excess oiliness of the skin surface, ensure hydration and provide an optimal UV proportion, balancing the symptoms of acne and the effects of treatment. Its patented Oleosomes technology, present inside Cetaphil offers sun protection filters in a lightweight hydrating texture, with barrier repair properties. Offering a high and well-tolerated sun protection, it protects against the harmful effects of UV radiation, including post-inflammatory hyperpigmentation and photosensitivity reactions induced by the Acne medications. This product contains humectants and emollients that provide immediate and lasting hydration in the skin prone to acne. It also contains Hydroxypalmitoyl Sphinganine, Ceramide 5 that helps repair the damaged skin barrier and promotes moisture retention, plus the addition of zinc gluconate, with its anti-inflammatory properties helps soothe the skin and also controls the levels of sebum on the surface of the skin, leaving the skin free of fat and fresh. It has been clinically proven that the daily use of Cetaphil dermacontrol facial moisturizer daily FPS30 helps balance the erythema, dryness and roughness of the skin with acne under treatment in just one week. Cetaphil Dermacontrol Moisturizer SPF 30 goes beyond the common moisturizers, helping to protect and repair the skin under treatment against Acne, balancing the symptoms of acne and the effects of treatment. Active sunscreen Ingredients: Avobenzone 3% , Octisalate 5%, Octocrylene 7%. Inactive Ingredients: Water, Isopropyl Lauroyl Sarcosinate, Glycerin, Dimethicone, Diisopropyl Sebacate, Silica, Polymethyl Methacrylate, Aluminum Starch Octenylsuccinate, Sucrose Tristearate, Dimethiconol, Pentylene Glycol, Polysorbate 61, Sodium Stearoyl Glutamate, Phenoxyethanol Caprylyl Glycol, Tocopheryl Acetate, Glycyrrhetinic Acid Panthenol, Triethanolamine, Allantoin, Carbomer, Potassium Sorbate, Zinc Gluconate, Xanthan Gum, Disodium EDTA Hydroxypalmitoyl Sphinganine. Cetaphil Dermacontrol SPF 30 Benefits. Lightweight moisturizer for oily and acne-prone skin: Cetaphil Dermacontrol Moisturizer is specially designed for oily or combination skin prone to acne. This allows a light, fast and lasting hydration, which reduces the shine and oil on the surface. Restoring the balance of the skin. 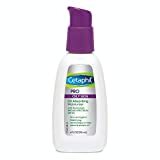 Effective ingredients soothe skin and absorb oil: Non-greasy and fast-absorbing, Cetaphil Dermacontrol Moisturizer contains a variety of fast-acting ingredients, including Micropearl technology to absorb oil and reduce shine, and licorice root extract to soothe dry and irritated skin. The patented Ceramide technology is compatible with the barrier function of the skin, while the allantoin and licorice root extract dry and irritated skin. Tested soft and non-acnegenic: Dermacontrol Moisturizer is hypoallergenic, non-comedogenic and suitable for sensitive skin. This moisturizing facial cream is for daily use and is recommended for people under treatment for acne and has been shown to help soothe the redness and dryness that can be caused by prescribed treatments. This moisturizer is almost perfect, when applied it creates a thin moisturizing layer that lasts for hours, restoring the balance of your skin, providing a soothing sensation that soothes skin irritation. In turn regulates the production and absorption of oils, decreasing the excess of facial shine, while positively impacting the recovery of acne breakouts. If to all the above we add their effective sun protection, which provides an SPF of 30 throughout the spectrum, no doubt you will agree that this product is the right one for your skin, if you are oily or mixed skin. Only one negative aspect: If you are going to swim or perform outdoor exercises that cause excessive sweating, you should use a waterproof sunscreen. Out of this, I recommend you to try the benefits of this wonderful moisturizer, you will not regret it. Final conclusion: Cetaphil Dermacontrol Moisturizer SPF 30: The Best Facial Moisturizer for Acne-Prone. Designed for oily skin types, Excellent for soothing the effects of acne treatment. Completely safe and affordable, with the advantage of sun protection, oil control and moisturize the skin. All Skin needs a Moisturizer and Sunscreen. Sometimes is difficult to find the right ones. With Cetaphil Dermacontrol Moisturizer with Sunscreen SPF 30 you CAN’T GO WRONG. If you have an oily or mix skin and prone to Acne. The 3 in 1 Cetaphil PRO is the perfect choice.